Income share of the richest five per cent of Bangladesh has been on the rise over the last three decades while that of the poorest is decreasing, a recent research has revealed. While the richest five per cent of Bangladesh shared 18.85 per cent of the total income during 1991-92; their share rose to 27.89 per cent in 2015-16, it has found. Meanwhile, the income share held by the poorest five per cent of the households fell from 1.03 per cent to 0.23 per cent during the same period, the study conducted by the think-tank Center for Policy Dialogue showed. "In 2010, the richest five per cent of the households was 32 times richer than the poorest five per cent," said Fahmida Khatun, executive director of the CPD. "This difference magnified astronomically in 2015 when the richest five per cent was 121 times richer than the poorest five per cent," she said. She revealed the stark contrast at a seminar on Sunday. The CPD's findings show that despite the rise in GDP growth and decrease in poverty over the last few decades, inequality is also significantly on the rise. CPD researchers noted that despite the rise in employment, the jobs created were not adequate to meet the market demand. According to a World Bank projection, some 2.1 million people are expected to enter the country's labour force every year between 2013 and 2023. Government statistics said that a total of 1,296 thousand jobs were created in Bangladesh. "This implies that even if 1.3 million jobs are created each year, about 800 thousand newly unemployed people will join the already significant number of jobless in the country each year," Fahmida said. When it comes to healthcare, the CPD researchers showed that despite quantitative progress in health indicators, the quality of both public and private medicare service is unsatisfactory. Resource constraint, lack of professionalism, poor management and inadequate policy initiatives were blamed as major reasons for such a poor quality of healthcare. "The rise in per capita public expenditure on health remains insignificant and has increased by merely Tk. 205 in between FY 2009 and FY 2018," Fahmida said. The CPD research noted an insignificant rise in per capita public expenditure on health has led to high out-of-pocket expenditure. In Bangladesh, 71.8 per cent of health expenditure was financed by out-of-pocket spending in 2015, which was high in South Asia. As for social security, the CPD study found that 41.3 per cent of the total budget for social security in FY 2018 was allocated for the pension of the government officials. Meanwhile, the social security budget excluding pensions has been on the decline -- from 2.1 per cent of GDP in FY 2011 to 1.7 per cent in FY 2018, the study revealed. The CPD study also noted for FY 2019, the coverage and allocation for eight out of the 10 largest social protection programmes has increased from the previous year. However, per capita allocation for maternal, neonatal, child and adolescent health programme has decreased by 19 per cent, they noted. "For inclusive growth, you need inclusive democracy in the political processes," said Professor Rehman Sobhan, chairman of the CPD. "And inclusive democracy in the political process means that there are opportunities for working class people to go and sit in the elected institutions so that they know what kind of problems are faced by their children." "In last 10 years, I cannot remember that there has been any debate in parliament on the state of schools or state of education." Pointing at the old cycle of cost overrun and time overrun in project implementation, Prof Sobhan said the government needs to investigate why this is happening. "This is not only a problem of corruption but also a problem of the efficiency of relevant organisations," he added. Speakers called for qualitative and inclusive growth as well as improving the quality of health education. "We claim that we are having 7.0 or 8.0 per cent growth and poverty has come down. These are all good numbers but it is also important to understand the dynamics of these numbers," Prof Sobhan said. "You need to get proper diagnostic of the process rather than just see the numbers." Experts at the event criticised the declining standard of education and growing commercialisation of education system. While education is supposed to be a right, some teachers are making it a commercialised commodity," said Rasheda K Choudhury, executive director of Campaign for Popular Education (CAMPE). Speakers called for increasing the efficiency and professionalism of judiciary in the country. 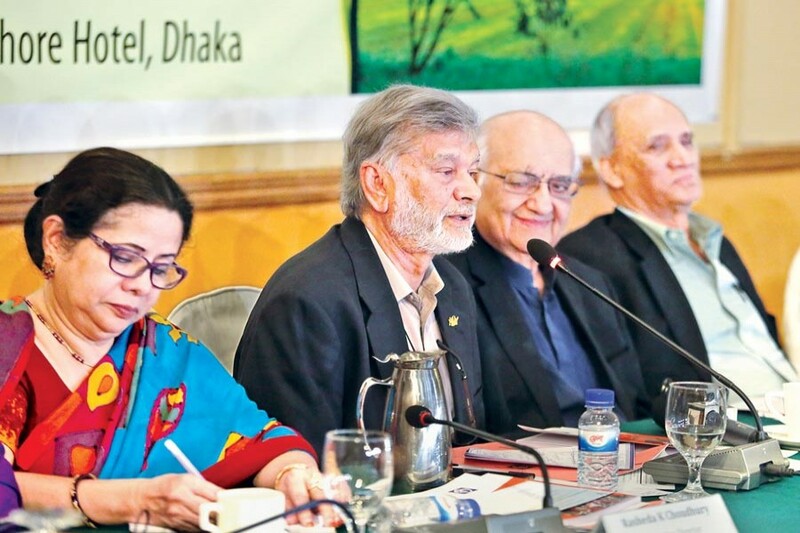 "While we have traffic backlog in Dhaka streets, we also have case backlog in courts," said Dr Zafrullah Chowdhury, founder of Gonoshasthaya Kendra. Dr Chowdhury called for greater decentralisation through strengthening of the local government. Speaking on the occasion, planning minister MA Mannan said the government is taking various steps for ensuring inclusive growth. He cited the community clinic infrastructure as an example of ensuring healthcare for the poor.